[00:22] rig industrial professionals out there. Welcome to the industrial todd podcasts. You know, my name is Scott MacKenzie. This is where it does real leaders come to talk. We celebrate the human power of industry and you know this week's interview is nothing short of fantastic. It's with a young lady by the name of ESTIE ran at e, s, t I. He ran and she'll put more money in your pocket. You know, we're all about creating solutions for you as an industrial professional. She's going to focus on marketing, branding, and all the good stuff that you need to do as a professional, as a company. So let's get this interview and show on the road. So thank you once again for joining the industrial talk podcast. [01:03] Oh No, no, no. Hey, you know what it is? Tropical storm Gordon is right around the corner because we broadcast from Mandeville, Louisiana. That's right outside of New Orleans. So we'll see what happens. We got our stuff ready to go. Got Plenty of water. We're prepared. That's what we need to do. Alright. 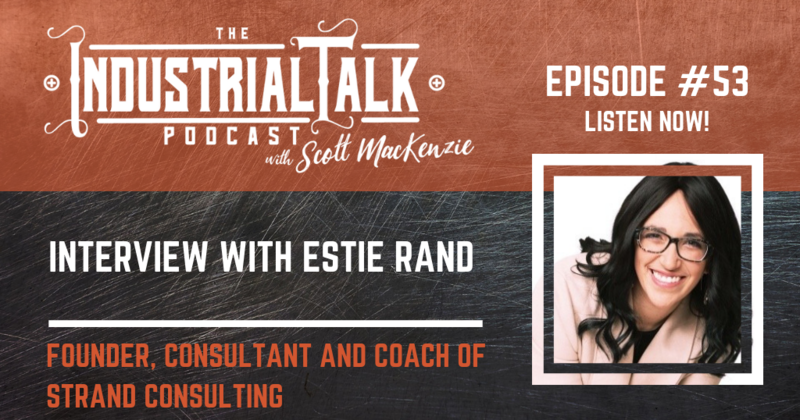 Estie Rand, she is the founder and CEO of Strand Consulting. But before we get into that interview, we've got us take care of some business. Delegate talk number one. Alright. You know I'm a big fan of reliabilityweb.com. Reliabilityweb.com. And they've got a podcast called reliability radio and that is the one that I'm on all the time. So. But nonetheless, I want you to be aware of some programs, have some events that are coming up. What you do is you go out to reliability, web.com. And uh, the first one is ural maintenance for Datto. [01:52] This is September 24th through the 27th. It's an Antwerp, Belgium. So any listeners over there that are in Europe now, they got plane over there too, so don't worry about it. It's gonna be a great event there. And then of course, December 10th through the 14th. This is a Benita Springs. This is imc 2018. I did 2017. And it's a great event if you're in the reliability space, if you are in the asset management arena, uh, I highly recommend and highly with an, you know, big age to go and, and find out more about that. So that's reliability, web.com. Go out to advanced tab and find a PR event near you because they got it going on. Number two. Okay. I'm all about books. I'm all about reading them all about finding the right. I don't know, you just got to keep on learning because this, you know, once again, I, I sit in the world where, where this information is available, you can be the best version of you because the information is out there. [02:52] And um, this story with a book called by a gentleman by the name of Jim Witt, a great friend. Mine, uh, I'd have to say he's a big influencer in my life and I'm so proud to be able to call him friend, but he's got a book out called writing for the brand and it's out there. It's out there on, on Amazon, but it's a great, it's a small novel, but you know what it does, it communicates the value of purpose. And I think as a company, as a professional in the industrial space, I highly recommend that you go out there and get writing for the brand and it's a, it's a great read. I enjoyed it. I, I read it in one sitting and, and uh, once again, that's with a for Jim Witt and it is a writing for the brand. Great Book Number Three. Okay. I've got a great relationship with a Colorado business round table that's Colorado Business Round-table and they've got a series out there for you supply chain people to go on out to that. [03:59] Uh, that's, that's CoBart, Colorado business round table or c O, b e r t.com. And they've got a great series on our supply chain. So once again, uh, if you are a supply chain professional, I highly recommend that you go out there, route around it's under podcasts, radio, tremendous resource, all free going out there. Number four. Okay, this is the last and final one before we get to the interview. Uh, we're working on a, uh, an industrial, uh, academy, a educational platform and what we're looking at right now, this is industrial talk and uh, we're breaking it up into leadership. We're breaking it into finance as well as operations. And then finally, business development, sales, marketing. But we're going to have a plethora of highlighted individuals that want to been on the podcast. And if you want to be on the podcast and you can share and fall into those categories, I would be happy to talk to you. [04:57] You go out to industrial talk.com and just say, hey, contact me Scott. I think I got some information. So that's number four. That is once again the industrial academy and it is, you know, it's all about education. It's all about content. It's going to be out there too, along with all of the podcast. So let's get on with this interview. So St Rand, um, she wants again, is the founder of Strand Consulting and you know, you know, if you've listened to me enough how passionate I am about branding and marketing and, and being able to leverage technology, you know, what Esties, she's a Rockstar, she knows what to do. She was blowing my mind with, uh, the, the information that she was providing on the interview. Um, let's put it this way, unless it's short and sweet, if you're not, and I mean if you're not professionally seeking solutions in the industrial digital world or if you're not finding ways of being able to leverage the technology your competition is and it's, and it's still, you got to get out there and it's painful to a certain extent, but you know, people like a ESTIE and others, I'm telling you right now, the answers are out there. [06:16] You can contact me. I've lived through this. This is important stuff. This, this is never going away. So why not figure out how you leverage technology to improve your brand, to improve your sales funnel, to improve your marketing. It's there. Okay. So Estie because she's with a strand consulting, she's amazing. So let's just get on with that because quite frankly I'm tired of listening to myself. So everybody she ran and she is the founder and CEO of Strand consultant and she's going to talk about marketing. Well, I'm here with a Estie a rand and uh, she has been so kind to be able to get on the old industrial talk podcast. Thank you very much for joining Estie. how are you doing? I am doing good today. How are you? Thank you for asking. Nobody ever asked me nobody. So there and I, and now I'm all caught off guard and I, and my thought processes all mixed up. No. Anyway. Hey Estie, you're out of California. It's getting warm but give us a little for one one on who you are and then sort of your company, but I want to hear about you and then how'd you get to be such an incredible professional? [07:31] Okay. Well thank you for that intro. Compliment. Welcome. So yeah, I am at an La. I'm actually originally from New York and I went to business school out there and then I actually did a 10 year stint in Jerusalem, which is where I grew professionally the most. Um, so I was a cio of a multinational nonprofit out there, so we were working with about 250 satellites that were all over the world. We had in the Fsu, former Soviet Union. We had all our across Europe, France, England, Germany, we had South Africa, we had South America, Argentina, Brazil, Chile, and then all across North America as well, and Canada. So I was kind of managing all of the information flow, complex budgets, business plans and stuff. And about six years in the different political, when you work for a nonprofit, you know, you're always, you're always at the winds of the board and the donors and the donors decided that we needed to kind of change management structure. So they hired a middle manager between me and my direct boss and um, for various reasons, threatened. I'm that guy decided that I was no longer CIO. I was his new secretary. And so I said, I'm actually really bad secretary, I'm good at a lot of things and terrible secretary, not good at coffee, not good at it. Blindly following instructions, you know, just bad at it. And I'm so I'm like, nope. I'm the person by. [09:04] Wow, that's incredible. That's, yeah, it was big. It was married and I had three children. And what did your husband think? Saying, okay, I'm Outta here. I'm not going to be doing this. [09:15] So my husband actually encouraged me. It had been months and months and the new guy was just terrible. He was really making my life miserable. Like I was supposed to travel to Buenos Aires for something and I was really excited and he's like, nope, you're not going. I'm going. And I was supposed to. And he took my team away from me. He's like, your team is my team now. I'm like, but he's terrible. He got fired two years later. He was so bad. It took them two years to get rid of him because just politics. But it had really, truthfully, like if I think about it, it had been brewing from about a year or two previous to this guy's entrance when the company had hired an external consulting firm. I'm and I had no exposure to consultants. Like, no, I went to a regular school, but I've never looked at consulting as a thing. I didn't know what it was and this consulting team that they hired. So I was involved with the budgetary level as well, so I knew what they were being paid. I knew how they charged and I'm like, dude, they are getting paid way more than me and they're saying the same stuff I'm saying, but they're getting listened to in the wrong line of work. I want to doing what they're doing. And so that was already brewing for awhile before this crazy guy came in. [10:20] But, you know, what's interesting with that change, with that reality? Um, do you regret it? Do you regret the fact that you're not there? [10:29] Oh, I see. Fantastic. It was so hard though. I cannot even tell you. My husband was still in school at the time studying, so I was the main provider for our family. Um, he's amazing. Like I could never have done this without him. And He, when he saw how miserable I was becoming at the job, it's like you have to leave. He's like, no, money is worth this, you know, you're going to figure something out. We'll figure something out. You can't stay. Um, and it was actually you here. They're crazy story. The night that I quit, a lot of people don't know this story. The night that I quit and going to say it live. Um, what happened was like I had had a sacred time with my children, bedtime prayer time every bit, every night, bedtime prayers that was mommy and kids that was sacred, that doesn't get touched. And things were getting so crazy at work. So crazy that in the middle of saying prayers with one of my kids, my phone rang and I answered it on a work call and my husband just looked at me. He said, you're quitting tonight is that you have never, in all your years, ever done that. This is totally overtaken your life, our lives in a place that we don't want this to go. You're quitting tonight. [11:32] Yeah. And that's what happens back. And look at you now, and this is a great segue into. I definitely can say I never looked back, but I will, I will. I will tell you about strands now you're talking about, you're talking to me and then we're going to be talking about strand. What a, what a credible stuff that you guys do at your, at the founder, because you are founder, you're the consultant and you are a coach. So talk to me about strand. [11:57] So Strand consulting was this little pipe dream I had when I left that job. Um, and truth be told, I had already been coaching on the side for a year, a year or two. Yeah, no, about a year before. After that consulting company came in. I'm like, I want to learn coaching. So it took a coaching course. I got certified by the ACP, American Academy of Professional Coaches, APC. And I, uh, I was already coaching on the side and doing some business coaching but very, very part time and I said, you know, it was 2011, it was the beginning of the small business boom. And I'm seeing everyone and their sister brothers pet dogs trying to start their own thing and putting out like little ads or cards or telling people about it. And I'm like, you know, I went to business school, I have a natural business, had my first profitable business I ran when I was 10 and it was a really good one actually. [12:43] I still use those tools with my clients. I know really. That's pretty cool. Yeah, it was, it was a good one. And you know, I, I want to help them. I really think if they just knew a little more about marketing or they little little like I would see ads and like the local weeklies or even some magazines and I'd be like, it was such a waste of space and money. Like I know how much that add cost and I know that they got zero business from it. And the coolest thing was when I started the company, I actually got calls from some of those ads from those people and be like, Hey, I know, have you ever saw my ad if you read the local papers, but I didn't get any business. I'm like, yeah, I know like, how do you know? I'm like, because I saw your ad, that ad didn't work. [13:15] It was so bad. And so that was my dream. But it was a dream, you know, and the dream was to create a full service consulting firm that could serve as small businesses because the big guys like this, from that my nonprofit hired, I saw what they charge. No small business can pay for something like that. You're paying for, you know, three, four consultants at a time to come down to your space, including all of their travel time. So like, just to like talk to them, you got like a thousand dollars just to like say hi, can you help me? Um, you know, and I, I wanted to do something for the little guys that would be the equivalent in terms of service offerings. And that's what strands is, strand consulting. We pull all the strands of your business together. I call it also like the two strands that run through every profitable business, which is passionate and strategy and and we do full service consulting for a small business that everything you would imagine a fortune 500 company getting from one of the big guys will do for the little guys. [14:12] The prices are scaled down and the strategies are scaled down. You can't. When you are a little business and you're playing in the big business world, you are not playing the same game. I would say the rules are overall the same, but you're playing a different game and you have to, you know, I looked actually at one point at the billboard outside my office complex. You were doing the big event and I was like, yeah, maybe I'll put something on that billboard $9,000 for one month for one billboard. You can't do that when you're a little guy. I was like, yeah, never mind. [14:44] But you can't even do it because you can't see the analytics into that. You. It's hard to say that billboard for nine resulted in this type of business and that's part of what makes it totally not worth it completely. And you can't, can't pivot. You can't say, I don't like the way that sounds. I don't like the way that looks, I don't like the way, whatever. And you can't just go up there and say, okay, now you rip that down, I'm going to put up something. You can't do that. That's another 9,000 paid down that road. And it's awful. I hated it. I hated it with a passion. [16:35] super fascinating. These are the kinds of things you can't get with old school advertising. And by the way, they do say now the classic marketing mix expanded to include online one, what, what a small business can do versus a big business even online is different. I want a big business can do online with their independence and their like 15, 20, 30 person teams. A small business has to do digital their own way also. But here's what we found for a small business they were targeting. Um, it's a, uh, it's a, it's targeting moms basically. And so they were figuring they're targeting moms, you know, between 25 and 45. And we did a whole online campaign and we found amazing ROI on the grandmas. We did not know that was our audience. And we're like, oh my gosh, the grandmas are loving this for the grand kids. [17:19] One of the things about online advertising is you find, you know, audience you didn't even occur to you. We the ROI because it shows you the depth, the age demographics of who's clicking on our ads. And we're aiming at these moms and we see that the, the 45 to 65, we are getting like a lower cost per click and we're getting more than we're aiming for, tons of them are like new new audience and we're developing a whole strategy. We're going to try to do like a big, like grandma day. Um, so digital not only is cheaper and gives you the analytics, if you know that you're reaching your audience, you can even give your insight into brand new strategy and a brand new audience. It's amazing. [17:53] You know, it's interesting that that's like an Aha moment, you know, we were just talking offline and Ed, it was like, I can't wait to be a grandparent because you know what I'm going to do, I'm going to spend money and I'm going to spoil these kids rotten. Right? We're not the only one. You and I are not the only one. And that, that demographic that, that behavior exists out there that, that, that makes sense. That's pretty cool. That's pretty cool. Okay. So let's pivot a little bit here. So we're talking digital marketing, we're talking about the benefits of it. You've been in the game for many, many years. Um, the listening audience is a industrial. They, you know, they, they're, they're looking at palm sir, looking at whatever it might be, but why is it important for that industrial company? Because when you look at an industrial company, you're looking at it, sort of that a spoken word anyway. You got a big business in the middle and then you've got a bunch of companies that support around, right? And of which, you know, why is it important for these guys, this company, these, uh, these entities to get into digital marketing. [19:03] I would say if you're doing any marketing at all right? And the way I define marketing is the creation and communication of value to your target audience to convince them to buy. And if you're doing any of that where you're creating and communicating value to your audience, trying to get them to buy, you've got to be online. There is no one today that's not. So whoever you're selling to, whoever your partners are, wherever you're trying to generate business from there, there, and you should be too. [19:33] It I, I was always under the impression of if you're not in the game because here's the problem, here's the reality of the industrial world tends to push away change and they're reluctant for it. I mean they just. There's a risk, there's an aversion to it, but the reality is is that this platform is going to be around, it's going to evolve and it's going to continue to be there and if you're not in the game, I know your competition is and it's all about, like you said, it's, it's, it's how are you branding, how you getting that message out, what does that, what's that value proposition? But how are you doing in a strategic way using this? This platform is key and that's been my sort of purposes to try to make sure outside of all the other elements associated with the industrial world, the bottom line, people want to fill that funnel. People want to be able to have their brand out there, grow that brand, go beyond whatever the boundaries that they have. And, and I, I'm a big, I'm real bullish on, on the digital marketing. So if I came to you and I was a manufacturer of, of a pump, what type of steps would you take me through? [20:45] So what is the pump do? Who Buys it? Who are you trying to sell it to? Yeah. And then from there you can create a customized. No, really. Tell me, tell me what is the time to like give me just like I'm being serious. Tell me a question. I'm going to tell you what time. Yeah, of course. I would've picked something that I know more about, but. Okay. Okay. [22:10] diets. It's a little clueless on what that means. So pure procurement would be its department. And what kind of accompany, uh, let's say a chemical manufacturing company. [22:23] Okay. So they make chemicals is department great. So when you look at digital, yeah, I like to separate digital into a online marketing, right? So we call that data general digital marketing, right? Because everything that's online is online and social media and so split those in half. And then within those two there's another kind of split category on becomes like a Matrix, right where you've got paid and quote unquote free organic. And I'm doing, you know, if he's not watching the video I'm doing like this little quotes, quote unquote free organic because very little is free online today unless you're doing yourself, in which case at the time of your, the cost of your time. So you're either spending your time which is totally worth money or you're spending money for someone else's time, but either way that's your free organic and, and so if we look at online marketing, yeah, so general digital strategy, if we fall into page, you're looking at pay per click on Google. [23:18] Okay. Which is probably a really good online strategy for something like this because people search for everything. So then you do what's called keyword research. Keyword research says, what are people looking for? So I've got keyword, you know, chemical pump, and then I looked at all the associated keywords. Now we have short tail and long tail. So just imagine someone is looking for. I'm going to use the shoe example because it's super easy. Someone's like dressy shoes, right? They take dressy shoes in here. That's a very, what we call a competitive keyword. Lots of people would love to show up for dressy shoes from like the giant shoe manufacturers, you know, Nike, Nike, they're not Dressy, you know, Zappos to like, you know, the baton to like everything to like some little guy in their basements who's like trying to like, you know, be independent shoe designer would love to rank for dressy shoes. [24:02] But here's the thing about dressy shoes. I might just be browsing. You're going to be a whole lot of money for that. There's a lot of competition and who cares? But if I go online and I'm like dressy dressy shoes, green and blue, size nine, I'm ready to buy. And that's what call a long tail keyword longtail keywords means there are more and more specific and the customers that look for those things are much more ready to buy something, whether it's a product or a service, right? Massage therapist in La, back specialty, right? Much more inclined to buy. Then I just heard search massage therapist. So I want to look at the long tail. What is someone going to look for when they're looking for me? And then I want to be there. [24:44] So you're, you're saying, hey, a google keyword search, that's one good place for something like this. And then from an organic point of view, I'm looking for the shoe or the pump or the valve or whatever it is, and I'm going to say I'm looking for something that. And then I type it in and I'm pretty specific about it. That's where the value comes. 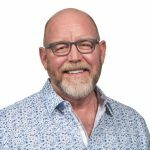 You're not digital, you're not out there actually saying, okay, now I'm going to push a marketing strategy that is highlighting those values. Is it, is it sort of more into your website? [25:17] So. Okay, so there's a few things here when we talk about pushing out a marketing campaign. Yeah. So then we talk about paid advertising. So what, so when we talk about keyword ranking, there's a paid version, right? Where you go to Google and like you see this little thing says ad, right? Those people pay for that. Those are pay-per-click, right? You only pay when someone clicks on it. Organic ranking means I incorporate all of these terms into my website and into my blog. Okay? Pushing out a marketing campaign might mean that I create a bunch of ads, either text ads or visual ads, even through Google that will go to where these people are going size. That's my target audience is procurement department. Where are they hanging out? I can do a selection of websites or I can tell it to do a general, you know, for this target audience and have it show up wherever they are. [26:02] And then I do something called re-targeting. Anyone who's ever come to my online websites, right. If I have a website, which I am going to assume we do because we need one, I can do what's called re-targeting, which means I basically follow them around the internet and I still remember once I went to some of the guys sites this, this blew my mind. He's a marketer and then I was, I dunno, I was like, I'm real simple.com with number recipes and I don't even know where I was and there's his face look we're doing on this site. And he actually said, I'm following you. Look here to find out how this was. This was like seven years ago, the very beginning of this kind of stuff and that's when I learned about re-targeting. I like clicked on it. I'm like, how did you follow me? I don't understand. [26:44] Yeah, so you don't want to creep people out like that. If you're not a marketer that's just, wow, we're going to have to take a break. Right now. We're talking with St Brad, strand consultant. Great Strategy, so stick to and we're going to get on the other side and we're going to start talking more about, again, marketing why it's important for you listening to the industrial talk podcast network around the industrial talk podcast as a new sponsored by the name of a s, g energy. Now this company helps private companies as well as public organizations of all sizes, reduce energy costs through the use of commercial led lighting, technology and electrical services. Now you know me, I'm a big fan of led just because. Well, first off, I don't have to change the lights, but add on a commercial basis. Oh my gosh. The energy savings is phenomenal. [27:45] The reduction in maintenance cost, phenomenal. Return on investment quick. It's, it's, it's incredible. And the environmental benefits self-explanatory. So you have any questions about led commercial lighting? You need to check out my friends at ASG Energy LLC.com. Find out more because they know what they're doing. So check them out. All right, welcome back to the industrial podcast. We're talking to St ran strand consulting and we were talking offline and we're taught and, and we're going to start to expand a little bit about that re-targeting because personally I'm freaked out about the whole thing, but I want to know how to do it and I think you industrial listeners need to know how to do it and if you don't, you've got to contact desk and will provide those, that information at the end of the show. So once again, let's talk re-targeting because I'm freaking out. [28:36] Sure. So it actually gets a lot more freaky because you can now be re-targeted from an offline interaction, which means like if you walk into a shoe store, yeah, they do it now. It's called geotargeting. Hey, your phone, your smart device is um, I think big brother could have only dreamed about the technology we have today. Okay, so they know where you are. Okay. Big Brother, also known as Google also knows Facebook, also known as big data, whatever you want to call it, they know where you are at any given second. Your phone has unique tracking id and so when you're plugged into any sites, they know where you are. And again, if you have an android, if you have an iPhone, it doesn't matter what you've got, they know where you are. And so if you're connected to any of these platforms, you walk into a store, that store can plug in a place. So again, big business has, has a little more access to some of these tools, but you can access them through different marketing companies. Some of it you can access yourself. Some of it not there, there are levels. Okay? [29:29] But the technology I got to step in. So because I want to be a neophyte here, I am a neophyte. Alright. So I've got my, my iPhone, it's it here and I go into that shoe. [29:42] Yeah, and I haven't done and haven't done anything, but you've got your Facebook open where you've got your Google open and the shoe store if it's a big company is tapped in there and so Facebook knows you were there, Google knows you're there. Verizon or sprint or t mobile nodes, you were there and they can get access to that data and then they'll send you ads or if you have any kind of customer reward number. Okay. They know who you are and they can connect that to all your online profiles and they know you were there. You, you are very, very, very trackable today. Okay. [30:14] No, I guarantee you people are just absolutely freaking out out there because I think and, and I, I, I did not know that I'm on Facebook and then all of a sudden I might be talking about and I don't know what it is. Let's say I'm interested in low fat yogurt run ever in my feet. I've just, I've just here in my head. Then all of a sudden my feed has, hey, here's some low fat yogurt and I'm going, what? Die? Who's listening to me, right? [30:47] Yeah. They analyze all your data. Correct. And other idea, but here they can analyze also your, your browsing history. Okay. I can target people to go to my competitor's websites. I can say anyone who's gone to that guy's website sends him my add. Anyone who's gone into that guy store, send him my ad. [31:06] So this from an industrial point of view is quite incredible because let's, let me, and correct me if I'm wrong, because boy, this is just blowing my mind. So when you, let's say shoes or whatever the codes, whatever it might be, that's sort of a huge market, but when we start talking about an industrial world, not everybody's gonna look at the pumps or valves or discouraged advocators if that was truly an item that's a very small pool, but you could still, you could in essence re-target. [32:15] that's what it does. So anyone who's come to your site and you get to track so you, you can't get access to a competitor's Pixel obviously, unless you have, then he'd give it to you, but you can track what people are typing to find them. And so here this is a situation where I would never do something like a Facebook ad because that's just so weird. You know, I would never want to be sitting on Facebook and I'm like looking at, you know, my brother in law's wedding and like there's an ad for a pump, like that's just misplaced, like that's just weird. But you know what I would do, I would do YouTube pre roll ads and I would do YouTube how to videos because the second largest search engine after Google is YouTube, which is owned by Google, but everyone knows, okay, people go into YouTube looking for how to do things. [32:51] So imagine like a new guy on the block. I'm procuring departments and I put in the best pump for x, Y, Z or x, Y, z best pump because I want to lead with the main word and not with the word though, because the leading words rank higher in search. Um, and then when someone's looking for this, that shows up, it shows up in YouTube as a video and then have a link below that. Again, each of these platforms, I like to say social media is like a party. YouTube is is a type of social media even though it's also search and when you're going to a party. Yeah, there's weddings, there's networking events, there's kids, birthday parties, there is black tie dinners. There's all different kinds of parties. Yeah. Each social media platform in and of itself. Facebook. I'm just gonna give you the big, you know the big seven Facebook, maybe it's five. [33:35] Facebook, Instagram, YouTube, Pinterest, twitter, LinkedIn. I feel like there was seven. Snap-chat, it was right because you're a big seven. Does your big seven right now and then you've got all different ones like yelp and TripAdvisor and all of these kinds of which are not quite social media. Those fall more under online, but there's social as well because you have all the comments, so there's the kind of that gray area where people aren't necessarily interacting and chatting like they're at a party. More like a bulletin board of recommendations if you will. So each of these parties is different. If I want to do and I want to go to the party where my audience is because I'm trying to sell, I'm not going to go a wedding when I'm trying to meet the people at the birthday party. That would be silly so I won't go to Facebook and. [35:14] that's a great place for stuff like that. Just from a real simple point of view, there is no reason. If you have a question not to get on Google type that question in and find that video or whatever to answer your questions. There is no reason why it's not like, you know, 20 years ago, 30 years ago where I had go to the library and that was a reason not to learn because I didn't want to get in the car, didn't want to do whatever and go find it in the library that Reid, you got knock on videos that said, hey, this is how you do it. And they. And it's everything. [35:50] Everything. Everything in the entire world, you know. Now they used to do, even when I was just starting out working already, this was starting once upon a time in interviews, you get interview and they'd ask you a few new things. Now in an interview, don't ask if you know things, they just ask if you know how to search it. If you notice, search it. That's fine. I don't need to have to know things. I just need to have to know how to find them and that's the truth. It's a whole different world. We are living in a whole different world. [36:17] It is at and you know, it's funny that whole, that whole mindset. It's now your, your, your patience level has just sorta plummeted because you shouldn't have gone it, man. If I don't have my guru and find it on my phone. Yeah. [36:42] weird wiring of the brain, man. It's just, it's off the charts and see what's so wonderful about this industrial world. We're still, I, I think, I think in general we're about five, maybe seven years behind where let's say that shoe store or that whatever it might be, because because this is what's always fascinated me as deep is, is the fact that technology is moving at a faster pace than humans can actually evaluate because the people who are making the technology is going, you know what else we can do? We could do this to Coco, Coco, Coco, boom, done next version. It's insane. [37:22] There's the guy down the hall from me who has a live robot. I saw him coming with it the other day. It's built on a Segway, so it's like one of the, you know, it's like a motorized scooter is coming down the hall, but I'm like, something's weird about that Segway. Like I'm ask them like, what is it? He's like, oh, it's a robot. That's what his company does and the thing it felt like it was alive. It tracks your entire scans. Your entire body can follow you. He's like, Hello Lumo. I forgot what he called it and the things like looks at him, he's like, follow me, and it scans him and it's like, okay, I have identified you, I will follow you. And I was like, oh my gosh, I have just seen the future future and it was so scary. And then it's like, it's just, I feel like I should pet it. I feel like it's a dog. Feels like it's alive. [38:04] It does it. Did it learn, was it learning license? [38:07] Yeah, yeah, yeah. It can learn. It can track, it can avoid people while you're on it. It's self-driving also it videos. So he uses it either type video himself or he uses it for films. So the [inaudible] it'll track behind someone and video them. It's scary. It's scary how stupid we're about to get. [38:26] I think that's part of the story in this. It does real world. We sit there and create a committee and that committee is solely evaluating some sort of new thing. Right. And that committee takes a long time and so when they come to the decision of saying, okay, I've, uh, yeah, we're going to go forward with version one dotto. And then they realized that version six Datto is out there and they just play as like, Oh God, what do we do? [38:51] Do you have gotten with faster? And I would say for someone who's, let's say you are really six years behind the time, so I'll tell you what your basics are. If you're gonna do you know if you want to understand, you know, how you add online into your marketing next. Because classic is, you know, you've got your print, you've got your radio, you got your television, everybody knows that. So if you want to do basic online a, you need to have some kind of a web presence. And I say that very specifically. That means if I go online and I type your name, I'd better find you or your pretend that's true. [39:21] Yeah. So I don't care if I find you on your own website and I don't care how that website is built. There are so many different ways to build websites, you know, if it's a custom build, if it's an off the shelf, if it's based on a theme, because I can go, that's an entire other talk of itself, but I don't care if you just have a Facebook page. Okay. I don't care if you just have a yelp. You need to be found online. I need to find you. I need to know that you're real and you exist and when I find you, I should be getting sold because I'm looking for you. Now. Next level would be if when I'm looking for what you're selling, I find you, but the very minimum, if I'm looking for you, I need to find you somewhere. [40:01] That 84 percent of everybody that comes in contact with you, Google's you, I would think that's higher, really high. Just because that just sort of blew my mind that I'm Scott Mackenzie Scott, and then they flip around Scott MacKenzie, Google. [40:20] Yeah. Yeah. Okay. You're and they take or they take your business card when they go home. Again, I won't say one that meets you, but anyone that's interested in you, so I would say 84 percent for anyone that needs you. Have anyone that's interested in you? I'd say probably like 97. If someone's interested in you and they want to see more about you, I think about it. You take someone's business card, you don't have time right now, but later you're going to go and check them out. [40:39] Absolutely. Exactly. How you better know who you are. Yeah. You better have it out there. You know what my problem is? My name is Scott MacKenzie. Yeah. There is a singer that was named Scott Mackenzie. He was out of San Francisco and his name pops up. He's dead now. He died, but he's a white kid. Asked him. It was like, I'm out there. I publish. Boom there. Scott Mackenzie, are you going to San Francisco? [inaudible]? No. Justice, no peace there. [41:10] You got to just attach your name to something else. Scott MacKenzie industrial. No, I'm serious. And like start making that your brand that everyone looks for. Um, like I had this great guy, my show. He's super cool. Um, uh, you check him out, was named Brian Wallace and he said to me, he's like, don't ever search my name because you'll never find me because there are so many elements, Wallace, why Amala is like African to find him, but he is the infographic king. So if you type in Brian Wallace infographic, you will always find him. And so when you start to attach your name to something that you do or to your location again and again, and people get used to that, then you can start getting found. [41:55] just how easy they are. We can cost you almost nothing. You can build it. You're okay if you're not taking client. There is a site. This is my secret, my secret is a site called Strikingly, um, and basically it's plug and play. Okay? Which means that I can make a strikingly gorgeous websites with zero skills. Zero. I need to like know nothing. I need to know like point click, click. Oh, that looks decent. Click. Um, I would say building a website, like I say, social media is like a party, so building the websites, like building a home, new different kinds of homes. Right. I can go rent a fully furnished apartment or house. It's all set. Alright. I just move in. You know that there's, there are websites that are like that. I just got to move in my stuff and there are websites that are unfurnished apartments which means like the basic frameworks there, but I got to figure out how to set it up in addition to like hanging my pictures and bringing in my clothing. [42:41] And then there's a custom-built house or apartment. Well you don't really custom build an apartment unless you're part of the building project, let's say custom built house where I'm literally digging from the foundation. So obviously that's going to be way more costly and way more suited to my needs. Then if I move into this apartment that's fully furnished, so I'm like, I don't really like this chair and that clause doesn't have enough room for my clothing, but like, okay, I'll make it work because it's a lot cheaper than building my own house. So for web presence it's exactly the same and all the players are the same. Like I once had a guy who said to me, he's like, just, I totally trust you. I really trust you. I just don't understand why I'm paying you and a graphic designer and a programmer and a copywriter. Why am I paying so many people for my stupid websites? [43:22] And that wasn't the case before. I had an internal team when I was at the beginning stages. Now we, we partner with external contractors all the time, but we also have an inside in house team and if the client wants. Yeah. So I explained to Tim, listen, I'm your web strategist. I help you figure out what is your web presence needs to look like? What kind of website site should you have? Should you be on social media website? Just be a Facebook page. Maybe you don't need a paper website at all. What's the web presence? Looked at me as strategies and then once you get to say, what pages should you have? I'm your architect. I'm drawing blueprints. You want to custom build? We we need. We need to understand what we're doing here. Now I'm building a house. How many bedrooms do you need? Do you want a den? Do you want to study? Do you need a backyard? Like I'm your architect, and then you've got your construction crew. You know they're doing the actual building, but it's actually going to build a house. [44:05] This is where the real disconnect happens. A mini and I would say a high percentage. It's just like a glorified business card. There's no strategies or tactics associated with what you want done in that website. Where do you want people to go? How does it benefit you? It's, it's more just like I said, a business card as opposed to a true business asset. [44:30] It's a, but at the same time, if you can't, it's still better than nothing, but yeah, a website today is what? A business card or a yellow page listing was in the seventies and eighties. No question. Like in the eight, if you're walking on a business card, you like, we're in a business person today. If you don't have a web presence, you're not. But again, web presence is very broad. I just need to find you online. I don't specifically need to have a website and if I do, yeah, it should be doing what I want it to do. Why? If I'm already going to invest, you know, we call it a CTA, a call to action. If someone's coming to your website, make them do something, walk them through a process, you can totally walk again. That's why I like the parable to a house. So the same, you know, when I walk into it as I'm walking them through. But again, if the house was just kind of shoved together, you know, because I was like, yeah, just, you know, build it, don't. I don't care. I just need somewhere to live so it's not going to suit my needs very well and it's probably not going to walk people through very nicely. [45:23] So because we got off on a tangent, I, we were talking about digital presence, web presence. You were saying if, if, if, if I'm a neophyte and I'm just trying to break into this, get a good website, whatever it might be, something like that. [45:38] There something online that people will find you, but at least make sure that you've. You've consulted some level of professionals. I've got one guy feel so bad for him. He invested in a website, but he, he went, okay, here's the thing with most creative endeavors, right? Any kind of marketing, good, fast and cheap. You only get two out of three. [45:57] Gotcha. Exactly right. So he wanted good, fast and cheap. He got fast and cheap and so he's got a website up. But if you, even if you search for him, like the thing that comes up for his website is like gibberish. It doesn't have like the right words, but it's him. And like if you click on it, it's his site. But like, ah, it's such a mess. So minimal professional insights say, Huh, hey, hey, this is just some ideas into maybe doing something differently. [48:56] and then what? Now what? Okay, so let, let's separate it into passive and active. So at least you have a passive presence that when someone looks for specifically you, they find you right? I either have a website, I have a social profile, I've got something. Now this applies not just to customer the supplies for staff. Also, if you're hiring and you want good talent, your talent, especially if they're young, they're going to look, they're gonna. Check you out online. This place look interesting is the kind of place I want to work. You know, if you want people to even find you when they're looking for jobs. A lot of job hunters will search industries and they'll search for jobs available. You can actually have a, you know, we're hiring or or staff or applications page on your site if that's something that's important to you. [49:36] So that's our passive yet, be there, be a place where go look and find you. Make it look professional and good and add it's better levels. Walk them through a process. Now there's active, right? So I can do. There are literally hundreds. I've just put together a documents of promotional strategies. I'm up to 142. Okay. Now that house, is that in-house strategies? Is that your everything? No, this is Zach can be shared. Oh No, people can get it from me. You can get it for me. You just got to send me your email. I'm going to share it. I'm going to share it. It's almost done. It's going to be ready next week. You can totally have it. And it is a promotional strategies for every business at any budget. That's what it is. So yeah, I started out as doing train. It was trying to go to 77 and every time I opened the documents I hear I think of like five more than 42 by the time you get. [50:26] It'll probably 1:57. I don't know. Anyways, so digital is probably like 50 something, you know, because when I talk magazine Ad, so there's really. Once I figured out how magazine ads work, trade publications, regular magazines, doesn't matter. It's pretty simple. Make add, put in right magazine. Okay. Like there's not a whole lot again, right? Kind of ad targeting find. It's pretty straightforward. Digital. There are so many options because I got my big seven players, but then I've got all of these know TripAdvisor and those kinds of sites, which again, this is not for manufacturers. It's just important to know. And then I've got keyword search and I've got website, so figure out where your audience is and how you're going to go after them. Everything from a re-targeting or keyword campaign, which means I can go and look up my competitors, my competitors that a website. [51:10] I can see what people search for when they find him and then I can pay money to show up first. So the competitive advantage you can generate with online marketing is insane. I can see what people are talking about and then figure out what's my own is doing. How do I figure it out? Hey, if I'm in the business for a long time, I know this in my own head. Okay. And if not, I can ask, you know, I asked my target customers and people who have bought from me, hey, how'd you hear about me? But like you ever search online? What do you search for? They ever searched on YouTube for videos. Do you ever see anything? You know, Instagram is a platform where if I wouldn't print it, frame it and hang it on my wall, it doesn't get, um, I shouldn't put it there. [51:45] It's all image platform. Words are important, but images are way more important. LinkedIn, you put a picture of like nobody care. That one's like, why are you stupid? Give me some words, talk to me, give me some videos, tell me what's going on. Every platform has a different party and I got to play, but again, but I got to go where my audience isn't the way they expect to find me, so my next level after being passively found is actively going after my audience, whether those are hires or customers and how do I find them? I figured out where they are and where they're looking for me. [52:14] Video is amazing. I got to tell you. Yeah, video is his specialty in, in our world where I mean it can be quite technical and, and it's always great to see it as opposed to just listen to somebody or read about it because you just really want to see it and there's no reason, no reason on the face of this earth where you can't have a video because everything you do, you use your phone. I don't care. [52:34] Yeah. And don't get intimidated. Exactly. A professional video will cost you 3000 plus at its minimum necessary to get off the ground. You can do something like powtoon. Okay. Or these pencils, sketch powtoons. Like there are these online platforms. Again, this is online, so you know, get your baby brother and now or you can learn it and you can find this at any age. Um, and you can create your own cartoons, which is like point, click, click. But the little minutia here, put the little popping sign there, put these words there and like I got a cartoon or I go on these sites like Fiverr and Upwork, which are these, you know, we call it the Gig economy where I can hire someone who's an expert in just that thing. This guy's an expert for like 15 bucks. He turns out a video in two days, just get done and it's so cheap. It's nothing. It's like it's pennies on the dollar and then you've got your content, you know, and if he didn't like it, so do another dollars. [53:26] When I came in contact with five or then all of these translated like Tb. And in other companies it's like, man, it's like you said, it's pennies on the dollar. There's no reason. It's like you can do this. Totally tailor. The programs are like, Eh, they're easy. [53:44] Oh you got to learn it. But you know what, you can just go to YouTube and learn how to use it because someone else is making a training video and they're making money. That's exactly right. [53:53] We got to wrap this up. We could go on for hours and hours and hours because I truly liked this subject. I think it's really beneficial for the industrial listener. You guys have got to get out there and see how do they get a contact with you. [54:04] Okay. So my social media party of choices. LinkedIn, you can find me, my personal profile. LinkedIn.com/link/n/St Iran's or just search my name? [54:17] Yes. E S T I E R a n d right. That's it. Then I gotta tell Ya. It's easy to find out there because there's not very many Estie. No they're not. I'm really lucky if you're looking at Susan Smith, good luck. [54:32] That's really, really hard to lose. I tell people. So you go to [inaudible] dot com and you can find my company Strandconsulting.net. Uh, because some other guy took the.com. He won't sell it to me, but whatever, he doesn't even use it, but you know what, but you can have a web presence even with the.net net when I am on Facebook also and I am on Instagram, but yeah, really hard to lose. Totally get in touch. I would love to speak to you. [55:01] Absolutely, and we're going to end and once again I'm going to be focused in on that, that you know, 100 promos, whatever strategies and stuff like that because all posted out on my website just because I think that that is so valuable because we in the industrial world need to recognize that this platform is going to be around well forever whether you like it or not. Either you're in the game or you're not in the game. Your competition is and so you want to be in the game. So Estie, thank you very much for your time. Awesome. Super Fun. This was a great time. Have a wonderful day and a listener's hang tight. We'll be back on the other side. Thank you very much for joining the industrial talk podcast. We'll be right back. [55:40] You're listening to the industrial talk podcast network. [55:54] Alright, that is Estie Rand. She was phenomenal. I, I think this whole digital world that we're living in a is just got a lot of great potential, but you can't just sit back on your laurels and say, okay, I'll figure it out later. All learned about it later, but I'm not telling you right now. You got to find people like asking big time to help you. It'll flatten out that learning curve and be able to do what you need to do, so go on out there. Once again, you got the contact information. That's std ran, that's e s t I e dot cheese out on LinkedIn and once again, thank you very much for joining the industrial talk podcast. We're going to continue to try to really amp it up in a in a way that really is meaningful for you as an industrial professional. [56:43] Once again, we're going to be bringing up new industrial academy to you and it's going to be separated into leadership and, and finance as well as operations and of course still in that funnel, that business development side, so be on the lookout for that because we're going to invest a lot of time, energy, and effort into making that a great platform for you and, um, being able to really make you a success. So thank you once again, if you're in the Gulf coast area, be safe out there. So nonetheless, thank you. Have a great week. And we will talk later.